Iron, vitamins B6 and B12 contribute to normal red blood cell formation. Plus thiamin (vit. B1) which contributes to normal heart function. Vitamin D contributes to the normal function of the immune system, whilst vitamins C, E and selenium contribute to the protection of cells from oxidative stress. Pantothenic acid contributes to normal mental performance whilst zinc and iodine contribute to normal cognitive function. Vitamins B6, B12 and riboflavin (vit. B2) contribute to normal energy release. 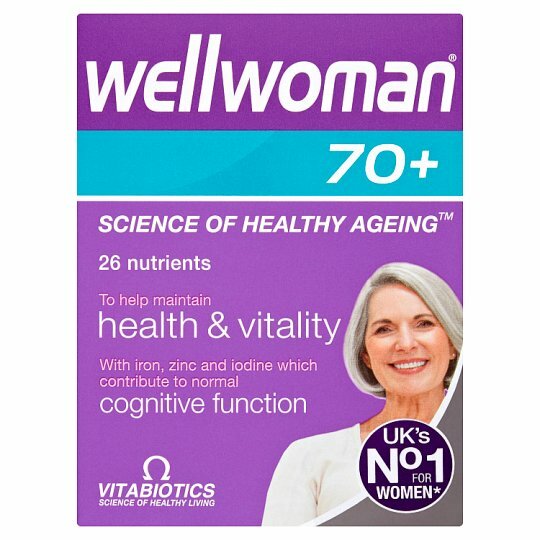 Wellwoman® 70+ provides 20µg of vitamin D in the preferred D3 form. Food supplements must not replace a varied and balanced diet and a healthy lifestyle. As with other food supplements, consult your doctor or pharmacist before using if you are under medical supervision, have epilepsy, a thyroid condition, haemochromatosis, suffer from food allergies, or are allergic to any of the ingredients. Not suitable for children. This product contains iron, which if taken in excess, may be harmful to very young children. Not to be taken on an empty stomach.